Judge Bisk has an extensive history clerking for various courts. She has served as a law clerk for the Hon. George W. Miller at the U.S. Court of Federal Claims and then for the Hon. Richard Linn at the Court of Appeals for the Federal Circuit. During law school, she was a judicial intern for the Hon. Randall R. Rader at the Federal Circuit and also for the Hon. Stephen S. Mitchell at U.S. Bankruptcy Court for the Eastern District of Virginia. In addition to her clerking experience, Judge Bisk also has patent experience in both transactional matters, at Cooley, Godward and Kronish, and in litigation at Crowell & Moring and at Sterne, Kessler, Goldstein & Fox. The Honorable Jennifer Bisk was sworn in to the Patent Trial and Appeal Board on March 1, 2012. During her tenure on the court, she has issued an impressive 35 final written decisions— canceling all instituted claims in 17 petitions, canceling some claims in eight petitions, and refusing to cancel any instituted claims in 13 petitions. Notable rulings include Judge Bisk’s written decision against instituting a petition for Inter Partes Review (IPR) filed by IBM against known patent aggregator Intellectual Ventures. IPR 2014-00681. The patent at issue involves an intrusion-detecting security system. Judge Bisk’s decision went through IBM’s five alleged grounds of unpatentability (citing 35 U.S.C. §§ 102 and 103), which relied on four different examples of prior art. Ultimately, the court determined that IBM did not show a reasonable likelihood that it would prevail on demonstrating the unpatentability of any of the challenged claims, and refuted all five grounds of IBM’s challenge. 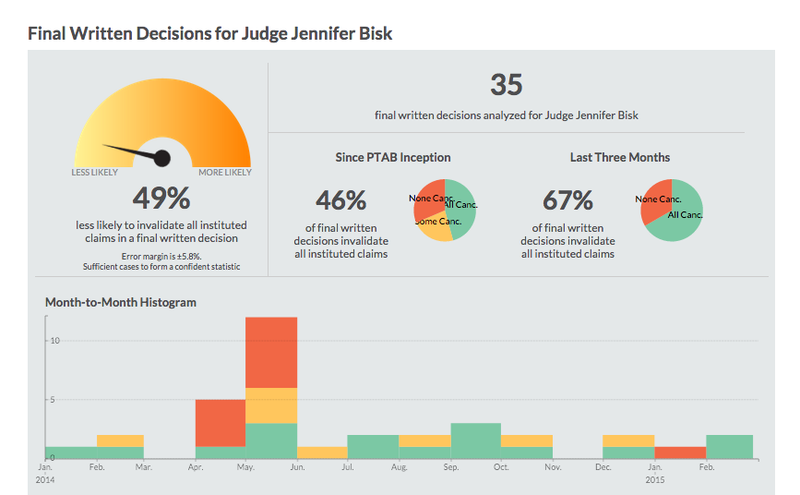 Further insight can be gained by viewing Judge Bisk’s record on Docket Alarm’s statistics platform. Users can view statistics on how many petitions Judge Bisk is hearing per month, petitions she has instituted, final written decisions she has issued, and the parties and firms that have appeared before her, and much more. For example, based on analysis of her 35 final written decisions, Judge Bisk is, on average, 49% less likely to invalidate all instituted claims than her fellow administrative patent judges. However, in the last three months, she has canceled all claims in 67% of final written decisions issued. Recently, Judge Bisk has been considerably less busy— she has heard only one petition in the past three months. Lawyers representing both petitioners and patent owners can use this information to determine what direction their litigation strategies need to take, such as whether or not to file a petition and what claims to contest if appearing before Judge Bisk. - Search all documents filed in all of Judge Bisk’s cases at the PTAB. - View Judge Bisk’s judicial profile, with statistics on petition grant rates and other data. Unboxing Videos are Fun and Lucrative, But Are they Legal? The recent YouTube phenomenon of “unboxing”- opening the contents of packaged tech items or toys with an accompanying review or description- has proved incredibly lucrative for a variety YouTube contributors. These videos get millions of views, along with millions of dollars in ad revenue. Perhaps the most famous of the unboxing contributors is an unidentified woman known only by her YouTube handle: FunToyzCollector (formerly “DisneyCollectorBR”). It has been said that she is currently YouTube’s highest paid star, grossing over $4.9 million dollars in 2014 from her channel. It’s easy to see how FunToyzCollector’s videos became so popular: her reviews of toys give kids (and yes, some adults) sneak peaks at the latest and greatest. However, FunToyzCollector and other unboxing channels may be drifting into a legal grey area. FunToyzCollector does not seem to be affiliated with The Walt Disney Company in any way. Thus, her videos featuring products that are registered Disney copyrights along with registered Disney trademarks could provoke the proverbial hornets’ nest and invite the entertainment giant to take a closer look at how their intellectual property is being used. Never one to shy away from enforcing their IP rights, Disney could claim a couple different theories of liability under copyright and trademark infringement, including copyright infringement for unauthorized display of Disney copyrighted characters and trademark dilution for unauthorized use of Disney’s famous registered trademarks. They could either enforce their rights in court, or attempt to remove the allegedly infringing videos from YouTube with a DMCA takedown notice. There are, however, a couple of legal doctrines that could protect FunToyzCollector. The Fair Use doctrine generally affords protection from copyright liability to those that use a copyrighted work for criticism, comment, news reporting, teaching, scholarship, or research. While her use is commercial in nature (she made almost $5 million last year), which would weigh against a finding of fair use, FunToyzCollector’s YouTube channel is clearly for comment and criticism, which strongly weighs in its favor. Further, it is unlikely that the effect upon the potential market for the Disney products could be positive for Disney by encouraging consumers to purchase the goods. Another defense could also protect FunToyzCollector from trademark infringement liability . Nominative Fair Use generally protects the use of another’s trademark so long as that use meets three criteria: (1) the use is in connection with the owner’s product or service, which was not readily identifiable; (2) the amount of the trademark used is as much as is reasonably necessary to identify the product or service in question; and (3) the use didn’t do anything that would suggest the owner’s sponsorship or endorsement of defendants product or service. See New Kids on the Block v. News America Publishing, Inc., 971 F.2d 302 (9th Cir.1992). While FunToyzCollector’s use of Disney’s marks is in connection with their products and not her own, weigh in favor of Nominative Use, her use of the Disney mark with regard to the other two factors is a bit murky. Viewers of her videos may not be certain as to whether or not she is affiliated with Disney. Further, her former handle was “DisneyCollectorBR” and “Disney” often appears in her videos and video descriptions – arguably more than what is reasonably necessary for identification. However, FunToyzCollector did take steps to remove “Disney” from her username, suggesting her awareness of potential liability arising from her use of their trademark. Since she has taken steps to change her use of the Disney mark, and her use is in conjunction with Disney products, this may be enough to tip the balance in favor of Nominative Use. For more information on Disney’s IP enforcement strategy, visit DocketAlarm.com to view all dockets for The Walt Disney Company.